Having written agreements in place are essential when doing business with, or as, an independent contractor. While the law does not require a written independent contractor agreement, and an oral agreement on terms would suffice, not having a written agreement often leads to misunderstandings. Misunderstandings lead to delays and hostility. Misunderstandings may be simply innocent: the parties understood the deal differently; or may also be intentional: one party is looking to take advantage of a situation. 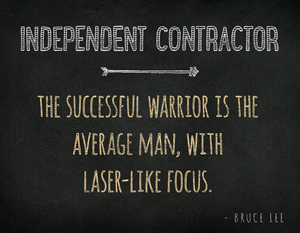 A written independent contractor agreement, on the other hand, avoids confusion. A written agreement of this sort establishes what the contractor has agreed to do and how much the hiring party has agreed to pay. An independent contractor agreement states what the two parties will do if a dispute does arise. Written independent contractor agreements avoid against situations where the hiring party’s word goes against the independent contractor’s word. It is a safeguard against these types of situations that may result in costly commercial litigation or delays. In simple terms an independent contractor agreement sets out the terms of the relationship between a hiring party and a contractor. Moreover, they help establish a worker’s status as independent contractor because it acts as evidence of an independent contractor/hiring party relationship, rather than an employee/employer relationship. Written independent contractor agreements avoid against situations where the hiring party’s word goes against the independent contractor’s word. It is a safeguard against these types of situations that may result in costly litigation or delays. Description of which party will be responsible for expenses and who which will provide materials, equipment, office space, etc. Other terms that are important in these type pf agreements include how to treat intellectual property and which party will be responsible for the employee’s hired by the independent contractor.